Home decor ideas and fashion inspiration for the fall season. Pinterest worthy DIY fall crafts, and the best sweater weather looks all included here. 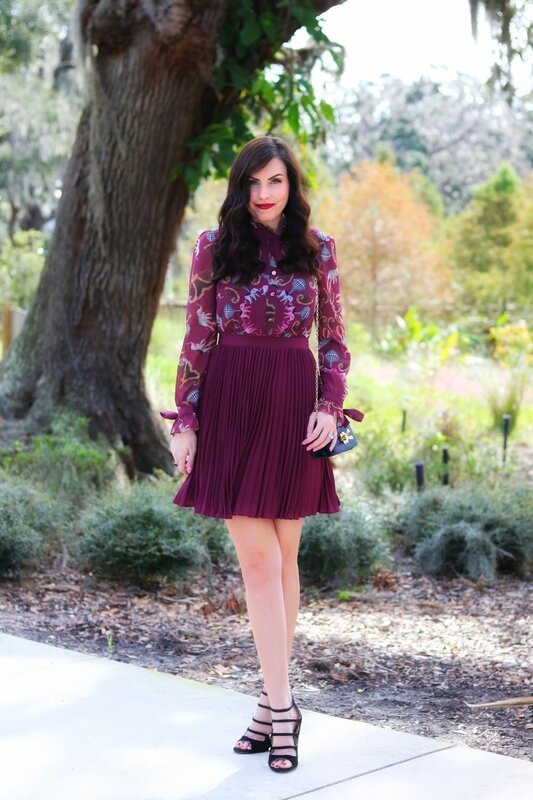 Don't you just love this Bordeaux, burgundy patterned Ted Baker dress for Fall?! I wore it out for date night with Mark the other day. I love the illusion of this ensemble because initially it's hard to tell if it's a skirt + blouse combo or a dress. The sleeves and collar are ruffled for extra femininity and there are also dainty bows on the sleeves and collar (totally swooning)! How cute is it paired with this elegant Ted Baker evening bag? Hold it as a clutch or wear it with the chain over your shoulders. I scooped up this entire date night look exclusively at Bloomingdales, and I am linking all the shop-able details for you below to keep everything easy to find.